What does success look like for you? How do you measure wealth? Many people answer this question with some degree of financial and material wealth. It makes sense. That kind of wealth is easily quantifiable and ensures the fulfillment of the first two levels of Maslow's Hierarchy of Needs - physiological and safety. But can it satisfy the other levels of love and belonging, esteem, and self-actualization? 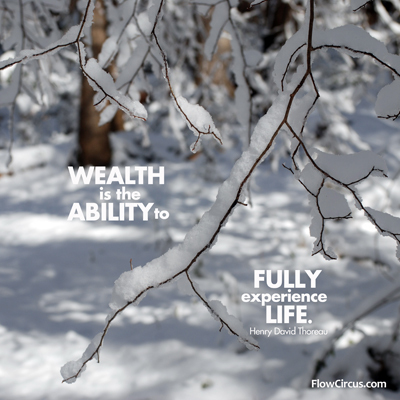 Thoreau wrote long before Maslow, but intuitively sensed that the common definition of wealth needed expansion. Lately, I've noticed an uptick in hearing myself and fellow female business owners saying, "I should be doing..." or "I need to..." Or feeling some guilt when taking time to replenish or focus on creative aspects of work such as writing this post. As I reflect more on when it comes up for me, I realize that it happens when I temporarily lose sight of my definition of success and the parameters that I measure it by. When I begin to compare myself to other business owners and how busy they seem or how much they're accomplishing (not always the same thing), I tend to start thinking in terms of "shoulds." Having clarity about what I value, the impact I want to have, and the ways in which I "fully experience life," provides the grounding I need to shed the guilt and refocus on what's important. To be mindful and engaged in what I'm working on when I'm working on it. And not waste time or energy on guilt, dread, or complaining. It's still a work in progress with some days easier than others. From the outside, this type of mindful engagement may look different from day to day. On a snow day in January, it meant that I took an hour in the middle of it to go into the woods with my camera and take this photograph. On another day it might be spending an hour to purge old files. Both tasks might look like procrastination (and on other days may have in fact been tools for it), but on the days I'm thinking of, I consciously chose these activities because they fit my goal of creating space for well-being, flow, and growth. When I start to find myself falling back into comparison mode, I'm going to try getting curious and ask the people I'm talking to what success looks like to them. It will help to eliminate assumptions I might have about the external actions that I'm seeing them take. It will also help me differentiate between their set of goals and mine providing more clarity. The conversation also opens up space for the other person to share struggles they might be having and ways we can support each other. I haven't always been in a position in which I had such flexibility over my schedule. But even when I worked in other jobs, I think staying clear on what was important to me, why I was there, and the impact I wanted to have helped me to stay engaged. It also made it very clear when I was feeling stuck or off-track and needed to make a change.